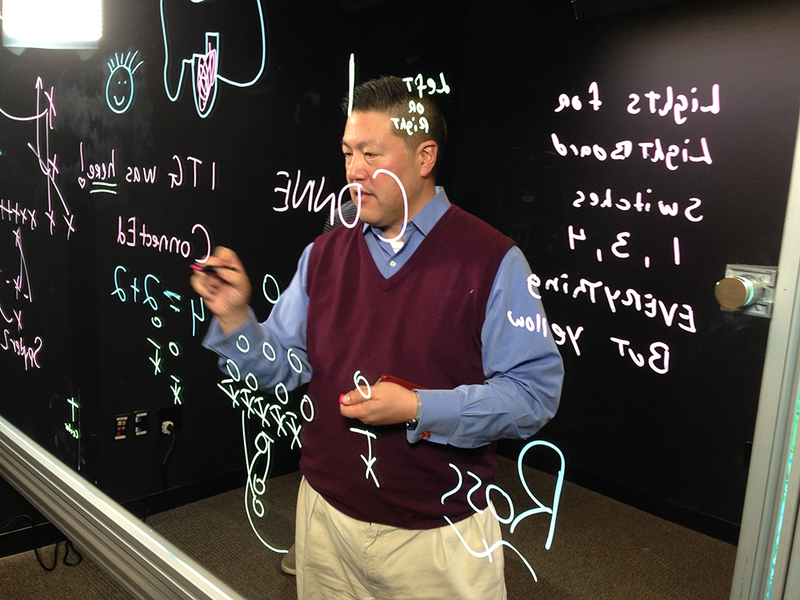 Journalism Department Chair Paul Niwa tests the new Evolving Media Suite light board. The journalism department is almost finished building a high-tech media suite on the sixth floor of the Walker Building according to Paul Niwa, chair of the department. The suite takes the place of an old service closet in Room 626, which previously held servers and computers for the journalism department. The centerpiece of the project, called the Evolving Media Suite, is a light board that Niwa said will enable faculty and students to teach and inform in an innovative way. The light board is a piece of glass that can be written on with dry erase markers. What makes it unique, however, is that the board stands between a camera and the writer. Since it is made of durable, extra clear sapphire glass, the writer is still visible behind the board. They can then write notes on the board, draw diagrams, even project images that can be written on. Essentially, the light board gives off the illusion that someone is writing in mid-air, according to Niwa. A key goal for this suite is to enable people to make short, informative videos that can then easily be put on the internet, Niwa said. These packages could range anywhere from breaking down a football play to examining a national election, as the board is designed to be multipurposed. The new space was funded by a donation from Jeff Chafitz, an Emerson alumnus who graduated in 1971. Chafitz gave the school $55,000 with the intention of helping students have the same kind of transformative experience he did while at the college. Chafitz passed away in November 2014, when the project was already underway. The initial design for the board was created by Michael Peshkin, a professor at Northwestern University. Peshkin made the designs open-source, and encouraged people to take his designs and expand on them. By doing so, Emerson is one of only a few schools in the country with this innovative technology. Following Emerson’s recent transition from standard to high definition broadcast programing, the Evolving Media Suite is equipped with a camera that can broadcast in ultra-high definition, the next predicted industry standard. Jack Ross, a junior visual and media arts major and a sports director at WEBN, said he is looking forward to using the suite for multimedia segments. "We would be able to use the markers to highlight different plays, to showcase links between players and teams," Ross said. "It's just going to open up a whole new world." The suite is not open yet, since a small crack was discovered in the glass of the light board. A replacement piece of sapphire glass will be arriving shortly, and Niwa hopes to have the suite open sometime in the next four to five months. There are no solid plans for another suite of this nature at Emerson, but Niwa said he is hopeful. “My dream is that this is so popular that we have to make another,” he said.